Later - can make seki. Or White can simply play for 7 points in the corner. White dies from snapback after . allows to start a ko, which Black takes first at a. However, this result is inferior to unconditional life. LukeNine45: White should only go for the ko if White is guaranteed to win it, a case that will be rare since Black risks so little here. In some cases the ko will be better, but usually the seki is. Also I think seki is usually considered better than ko (for the defender) in L&D problems. White takes the ko first. 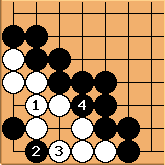 If white wins the ko, the corner is worth six points. If white loses the ko, black has 22 points. If white plays for seki instead of ko, then noone gets any points in the corner (assuming Japanese rules). So let's pretend that black has exactly one ko threat on the board, worth 30 points, and white has exactly one ko threat on the board, worth 23 points, and there are no other ko threats. Now if white plays the ko and wins it (black answers white's ko threat), white is six points ahead compared to playing the seki: this is a mistake by black. Black should ignore white's ko threat and take the corner--i.e, white loses the ko--but white is still one point ahead compared to playing the seki. 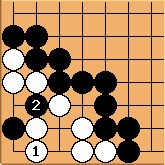 This is best play for both sides: white should go for the ko and lose it. Someone please correct me if I've got this wrong. Of course it's all hypothetical--usually there are more ko threats and it's much more complicated. As LukeNine45 says, in life and death problems (where you're not shown the rest of the board, and know nothing about ko threats) the convention is to prefer the seki solution. Bill: After the position is worth -3.5 points of territory by Japanese scoring. (0.5 point better for White than by area scoring.) If White wins the ko he gets only 5 points of territory. So his extra move to win the ko gains only 1.5 points (3 points by area scoring). Since the corner will normally be played out when the hottest play gains 3.5 points (5 points by area scoring), White will usually not be able to effectively make the ko, as winning the ko will not be worth it. (More later about xela's specific example).